We worked with this railway consultancy to create updated business cards for their Managing Director. Having used VistaPrint in the past, Brett now wanted a new business card design to replace his existing cards and chose Primary Image to come up with a more professional style. 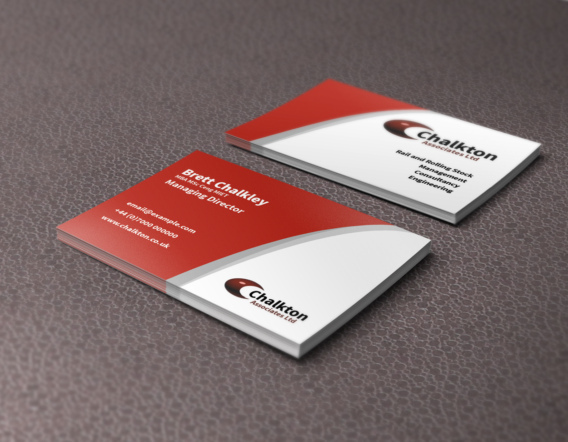 The consultancy’s business cards now have a smart red branding, with this double-sided “swoosh” design that was chosen after discussion with Brett. He was also keen on having a premium feel to his consultancy’s business cards, so we printed these on thick 450gsm paper, with gloss lamination applied to both sides. After sign-off, the business cards were delivered in just two working days to his Northamptonshire base. I needed a new business card design. Mike provided a first class service in terms of design and communication throughout. A pleasure to deal with and definitely recommended. They arrived in amazing time! Very pleased with them. The consultancy specialises in the rail industry, in particular in the rolling stock and engineering areas. Brett has worked in the railway sector for over twenty years.